And then, all of a sudden, it was the day: June 9th. It was hotter’n’hell™ in Austin that day, and Marc picked me up earlier than early. Jack and I were going out to the park to watch Christine and show our support for her and all of the girls. We arrived, parked, and then trekked 30 something miles from the parking lot to the swimming area, and arrived just in time to see Christine emerge from the lake. She ran to the bike area and tagged Cyndi (they were on a relay team). Marc and I went and found some shade, (ok, we brought a tent) near the finish-line, and a few hours later Cyndi and Christine came running (they met up at the end of the bike event and ran together) up the hill towards us. 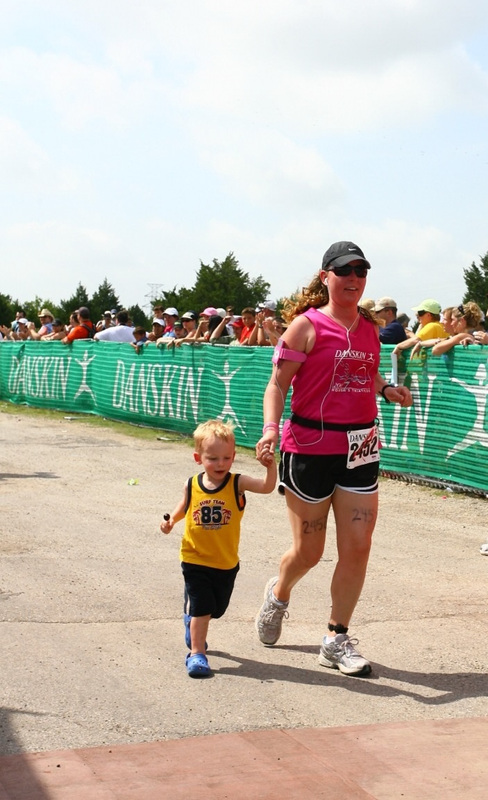 That’s Christine finishing her first Triathlon, and Jack helping motivate her… which I think it just precious. Cyndi and Christine’s relay team name was “Dos Mamacitos” and they crossed the finish line, both with their oldest kids running along side them… definitely a day to remember for us, and them. Congrats on running the race babe. I’m very proud of you for doing it. Sorry, I’m a month late on writing this.